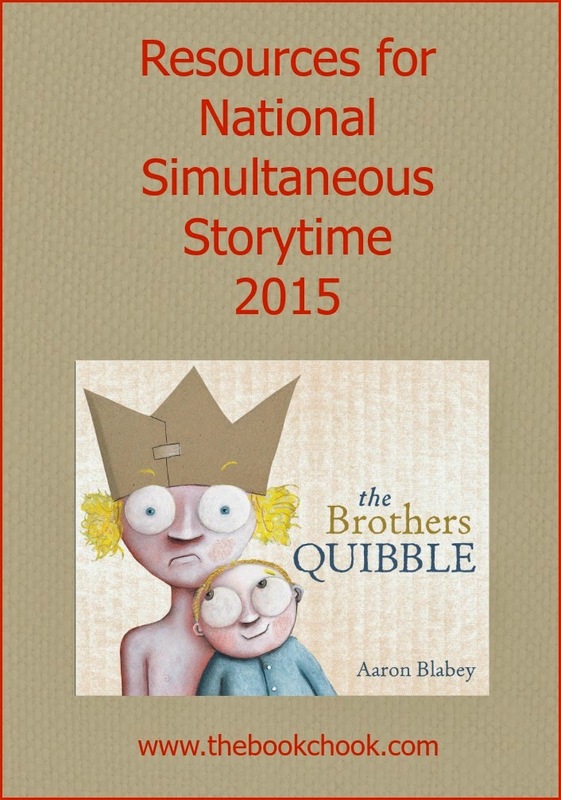 This year NSS takes place on Wednesday 27 May at 11am when children across Australia will listen to The Brothers Quibble being real aloud. It’s yet another opportunity to celebrate reading with our kids, and promote it throughout our country. There are stacks of useful resources available via ALIA’s website. Thank you ALIA, Penguin Random House, and Aaron Blabey for doing so much to make this wonderful literary special day such a success! Here are some of my ideas for treating the book with kids. I have pitched them more at a mid to upper primary level, because I think it's a children's picture book that older children will get a lot from. * Ask children to make predictions, based on the cover. Look at the way Blabey portrays the two characters on the cover. Who might they be? How has he illustrated them? Look particularly at how he portrays the eyes. What effect does that have? Have kids seen any other illustrations where the eyes are disproportionately large in a face? (Anime or manga and other graphic art could be one example.) Do older children know any animals with big eyes (aye-ayes, giant squid)? * What does ‘quibble’ mean? Did the author maybe choose that word because of the meaning or because he liked the sound of it? Or both? * When we first meet Spalding, he’s wearing a crown. Why do you think he’s been depicted that way? What’s happened to the crown on the last page of the book? Why do you think that is? * How did Spalding feel about the birth of his baby brother? Why might he have felt that way? * What nasty tricks did Spalding play on his family? How did they feel about that? What did his parents do? * If you were a mum or dad, what would you do about a child like Spalding? * How did things change once Bunny learnt to talk? Why do you think that was? * Spalding played mean tricks on Bunny. Can you think of any other tricks he might have played? How would you feel if someone was mean to you? Did Bunny feel that way? * Do you know any kids like Spalding and Bunny, who love each other but fight too? * Examine the illustrations closely and discuss them with your friends. Try drawing the different eyes of the characters in the book, when they’re feeling different emotions. What techniques has Blabey used to convey that emotion? How do the other facial and body features strengthen it? * How does Blabey use background colour to create an atmosphere? Look closely at the illustration of Spalding when we read about the evil-minded master plan and then the next page. What details in the pictures contribute to the different atmospheres on those two pages? * Create a picture of your brother/sister/cousin and you. Experiment with some of the art techniques you noticed in The Brothers Quibble. * Blabey has written The Brothers Quibble in rhyme. How do you think it would have been if the story didn’t rhyme? Read some of the story aloud. Re-write that same part of the story in your own, non-rhyming words. Which style do you like best? * Without any sounds, mime the way you think Spalding felt when he realised he had to share his life with a baby brother. Paint a picture about his feelings, thinking carefully about what colours, lines and shapes will contribute to the effect. * In groups, improvise a scene between two parents, a very angry young boy, and a new baby. * Create a crown for yourself. There’s a template available among all the great resources at ALIA’s website. How can you make your crown stand out from the crowd? * ALIA also offer excellent printable resources like find-a-words, colouring sheets, door hangers etc. If you enjoyed this post, you might be interested in other special book-related days where we can celebrate reading with kids, or my first two posts related to Children’s Book Week in 2015: Activities for Children’s Book Week 2015 and Children’s Book Week 2015 - Challenges for Kids.